Irish industry leaders gathered at the offices of Travelport Digital Dublin, to celebrate the Global Meetings Industry day as well as the official launch fo TurnedSee platform. 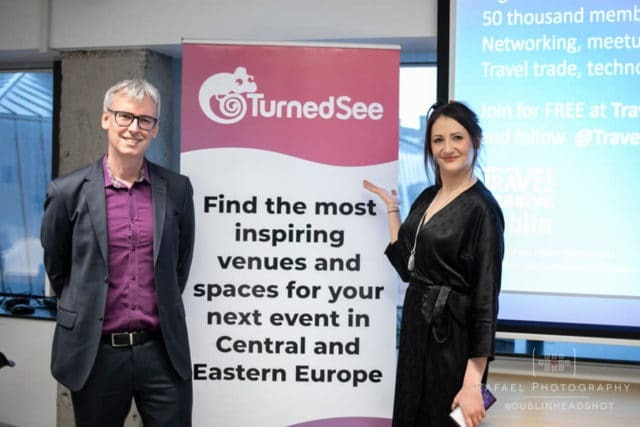 TurnedSee is the first platform/ tool for busy event planners wanting to search and book venues, hotels, restaurants or spaces for events and groups in Central and Eastern Europe. Siginifact infrastructural developments and as well as EU investments allowed Eastern European countries to perfect their MICE offering. TurnedSee wants to bring many hidden gems (hotels, venues, spaces), which would not have access to the international event planners, and help them to compete with the cities such as London, Rome or Paris. Turnedsee’s mission is to allow event planners to quickly discover, research, compare and request the venues they like, at the comfort of their office or home. The tool helps event planners to find the right places as a matter of a few clicks. It provides the best user experience and connectivity with suppliers, as well as saves time and stress in the complex venue research process. Many esteemed guests have attended the event including the Dublin Convention Bureau director- Sam Johnston, The head of Airline propositions of Travelport – Mark Lenaham and the Head of Marketing for SITE – Padraig Gillian. The CEO of Turnedsee, Pauline has been born in Poland but raised in Ireland, where she started her professional career. She said that there is a certain way of promotion of the destinations in the west. The cities such as London or Barcelona have a long tradition of hosting groups and events and understand how to compete in the international market. However, this can now be applied to Eastern Europe, which has worked hard during the past number of years to deliver many exciting projects for the events industry. Prague and Krakow are already winning in the international rankings, and more can be done for other cities in the region. A bit of imagination and unique approach and Easter European countries have a chance to become as busy as Western Europe, in their bid for international groups and events.